Complete the questions in the blue boxes. PLEASE NOTE: There are 20 questions in blue boxes inserted throughout the article. Machines can be incredibly complex (like airplanes or automobiles), or very simple, such as a hammer. 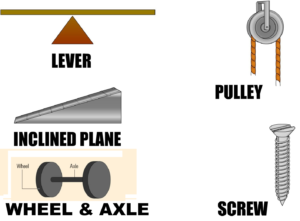 A simple machine is a mechanical device that changes the magnitude or direction of the force. The wheel and axle is a simple machine that reduces the friction involved in moving an object, making the object easier to transport. When an object is pushed, the force of friction must be overcome to start it moving. Once the object is moving, the force of friction opposes the force exerted on the object. The wheel and axle makes this easier by reducing the friction involved in moving an object. The wheel rotates around an axle (essentially a rod that goes through the wheel, letting the wheel turn), rolling over the surface and minimizing friction. When pushing any large object, a wheel reduces the efforts. A primitive example could be rolling a large stone with logs placed underneath. Common examples of the wheel and axle might be a car, a bike or a hand cart. QUESTION 3 out of 20 (Write the question and answer): What force does the wheel seek to reduce or overcome? QUESTION 4 out of 20 (Write the question and answer): What is the name of the rod that goes through the wheel, letting the wheel turn? QUESTION 5 out of 20 (Write the question and answer): Give a primitive example of a wheel? The invention of the wheel and axle (the rod around which a wheel turns), around 5500 years ago in the Middle East, revolutionized transportation and gradually brought huge changes to society. It’s easier to push a cart loaded with a heavy box than to push the same box along the ground because the cart’s wheels and axles reduce friction and provide leverage. No wheels exist in nature.4 Throughout history, most inventions were inspired by the natural world. The idea for the pitchfork and table fork came from forked sticks; the airplane from gliding birds. But the wheel is a completely human invention. According to Michael LaBarbera, a professor of biology and anatomy at the University of Chicago, only bacterial flagella, dung beetles and tumbleweeds come close. And even they are “wheeled organisms” in the loosest use of the term, since they use rolling as a form of locomotion. QUESTION 6 out of 20 (Write the question and answer): When and where was the wheel invented? We tend to think that inventing the wheel was the work of cave men, right after learning to walk upright. But several significant inventions predated the wheel by thousands of years: sewing needles, woven cloth, rope, basket weaving, and boats. QUESTION 7 out of 20 (Write the question and answer): Some historians believe the first wheels were not used for transportation, but for what other purpose? The wheel and axle is used either as a force multiplier (such as a doorknob, steering wheel or fishing reel) or as a distance multiplier (such as on a bicycle or the driven wheels of a car). In the first kind of application, the larger wheel is used to create more torque (in the axle) with less force. QUESTION 9 out of 20 (Write the question and answer): Explain in your own words how a wheel and axle can be used as a force multiplier. Research any terms you are not familiar with. In the second type of application, when the axle is turned, the outside of the wheel turns at a greater linear speed that is proportional to the ratio of the radii of the wheel and axle. For example, if a bike wheel has a gear that turns eight inches in one second, and the wheel circumference is eighty inches, the wheel rotates through a distance ten times greater than the gear (and reducing the number of rotations of the pedals required). By varying the radii of the axle and/or wheel, any amount of mechanical advantage may be gained. Big wheels are used to multiply force in other ways too. QUESTION 12 out of 20 (Write the question and answer): Explain your answer to QUESTION # 11. Unicycle: The crank (pedals) rotate once each time the wheel rotates. Consider the unicycle pictured above. It is different from a bicycle in that it has no chain or sprockets. Rather the crank/pedals are it attached directly to the axle. Each time the rider turns the crank one rotation, the wheel travels one rotation as well. QUESTION 13 out of 20 (DO NOT write the question for this item, but show your calculations): If the crank is 6 inches long and the radius of the wheel is 10 inches, then how far will the unicycle travel each time the crank is turned one rotation? The APPROVED SOLUTION to question number 13 requires a bit of pre-algebra and the ability to ignore extraneous information. The 6 inch length of the crank has nothing to do with the solution. If the crank rotates once, then the wheel rotates once. If we know the wheel’s circumference, then we know how far the wheel will travel each time the wheel rotates once. 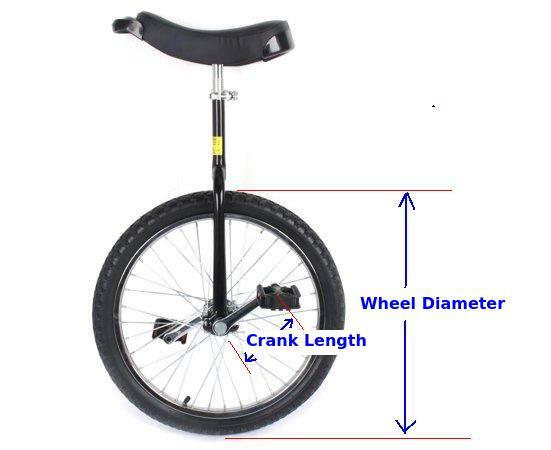 Each rotation of the crank/wheel makes the unicycle travel 62.8 inches. QUESTION 14 out of 20 (DO NOT write the question for this item, but show your calculations): Just to make sure everyone is on the same page, assume the following facts about the Unicycle question above. If the crank is 8 inches long and the radius of the wheel is 18 inches, then how far will the unicycle travel each time the crank is turned one rotation? QUESTION 15 out of 20 (Write the question and answer–or incorporate the question in your answer): Based on your observations about the previous question, what effect does increasing the radius of the wheel have on distance traveled per rotation? QUESTION 16 out of 20 (Write the question and answer–or incorporate the question in your answer): Assuming the turning of the crank/pedals continues at a constant number of rotations per minute, then explain how increasing or decreasing the size of the wheel increases the SPEED of the unicycle? The bigger wheel gives the driver more leverage. Wheels can multiply distance and speed as well as force. Bicycles have large wheels so they go faster. When you pedal, you power the inside of the wheel. But the wheel’s outer rim turns around faster and covers more ground, so your pedaling has a much greater effect. A wheel as a speed multiplier. The engine turns the axle at the center. The axle turns only a short distance but the leverage of the wheel means the outer rim turns much further in the same time. That’s how a wheel helps you go faster. 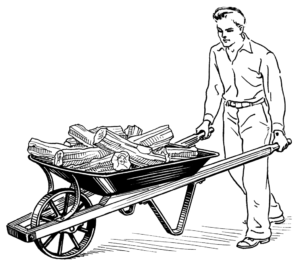 Wheelbarrow is a Class 2 Lever; and uses a wheel and axle. Wheelbarrows combine wheels and levers to brilliant effect. A wheelbarrow makes it really easy to transport a load from one place to another—for two reasons. First, its long frame acts like a lever, so the load is much easier to lift. Second, the wheel at the front means you can push the load sideways instead of having to lift it upwards. QUESTION 17 out of 20 (Write the question and answer): What two simple machines do wheelbarrows make use of ? QUESTION 18 out of 20 (Write the question and answer–or incorporate the question in your answer): Explain in your own words (don’t just copy from the article) how these two simple machines make the wheelbarrow such an effective tool. A gear is a toothed wheel that engages another toothed mechanism in order to change the speed or direction of transmitted motion. A gear train is a mechanism used for transmitting rotary motion and torque through interlocking teeth. A gear train is made when two or more gears are meshed Driver gear causes motion. Motion is transferred to the driven gear. Mating gears always turn in opposite directions. An Idler Gear allows the driver and driven gears to rotate in the same direction. Mating gears always have the same size teeth (diametric pitch). QUESTION 19 out of 20 (Write the question and answer): What does an idler gear do? QUESTION 20 out of 20 (Write the question and answer): Can mating gears both turn clockwise at the same time? Can mating gears both turn counter-clockwise at the same time?